The loggerhead shrike (Lanius ludovicianus) lives primarily in the Southeastern portion of the United States, but has been known to nest as far north as southern New Jersey and in the Ontario province of Canada, where they are endangered. Loggerhead shrikes are often found in open pastures or grasslands with elevated perches and nesting sites, especially areas that have barbed-wire fencing. The shrike is nicknamed the “butcherbird” for its habit of impaling prey on thorny shrubs and barbed wire. Their diet mainly consists of large insects, small mammals, reptiles and occasionally smaller birds. The loggerhead shrike, along with many other grassland bird species, is in steep decline. The loggerhead shrike has lost an estimated 74% of its population since 1970 and the population could decline by half in the next 25 years without significant action. It was identified as a Species of Greatest Conservation Need in the 2015 Tennessee State Wildlife Action Plan, making it a priority for conservation. The cause of shrikes’ decline in population is poorly understood and is the subject of much research. Direct loss and degradation of native grassland habitats has been cited as a primary factor in the decline of loggerhead shrikes. Nashville Zoo is a participating member of the Eastern Loggerhead Shrike Working Group, which was formed in 2013 and is composed of many state, federal and non-government entities. The Zoo has been working closely with the Shrike Working Group to identify research, conservation and management priorities in the soon-to-be-finalized Loggerhead Shrike Conservation Action Plan. Among these priorities is implementation of a collaborative loggerhead shrike trapping and banding project across the species’ breeding and wintering range in the Southeast United States. This project will help researchers evaluate the shrike’s migration, population dynamics, and habitat. The unique color combinations of the bands allow biologists to identify individual birds that are re-sighted. 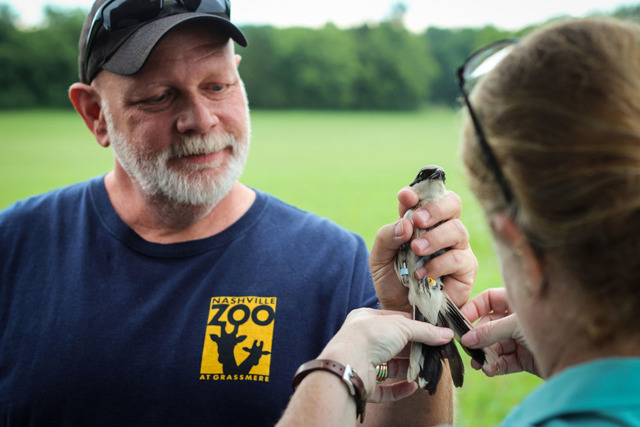 Nashville Zoo staff, alongside other local researchers, have been surveying and monitoring loggerhead shrikes in Middle Tennessee since 2013, and have successfully banded several shrikes. Each individual was banded with one standard USGS band and 3 plastic color bands (2 bands per leg) and released at the capture site. In 2015, one individual was also outfitted with a transmitter that tracked the bird’s movements for six weeks in order to create a map of its territories. 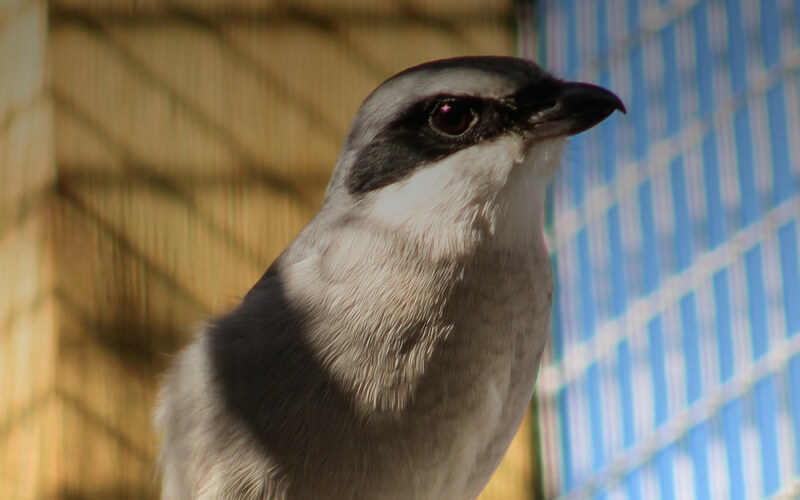 In 2016, the Zoo received four captive shrikes from Wildlife Preservation Canada for a migratory urge study. These birds now live on the Zoo’s property where the Avian Department cares for them and studies how they utilize their habitat during the different seasons. By monitoring wild populations and studying captive birds, we hope to learn more about the components of a suitable shrike habitat so that we can better manage land and provide recommendations to landowners on how they can ensure their land is a shrike-friendly habitat.